Most Enterprises are architecturally in a rigid and fragile state. This has been caused by years of legacy practices in support of poor code, design patterns, underpowered hardware (which focused on increasing MHz not parallelism/multi-cores). What follows is a brief review of what has led us here and is needed background for the follow-on post which exercises a theory that I’m testing. Early on in the Client/Server days even low power x86 servers were expensive. These servers would have an entire stack of software put on them (i.e. DB and Application functions with Clients connecting to the App and accessing the DB). This architecture made the DB the most critical component of the system. The DB needed to ALWAYS be online and needed to have the most rigid transactional consistency possible. This architecture forced a series of processes to be put in place and underlying hardware designs to evolve in support of this architecture. All of this was designed to GUARANTEE both Availability and Consistency. Web based architectures in the enterprise contributed to progress with a 3-Tier model where we separated the Web, Application, and Database functionality into separate physical systems. We did this because it made sense. 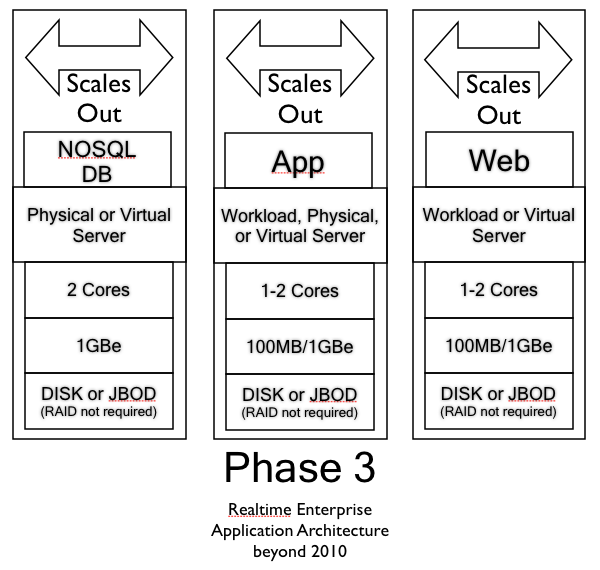 How can you scale a system that has a Web, Application, and Database residing on it? You can’t, so first you break it out and run many web servers with a load balancer in front. Next you get a big powerful server for the Application tier and another (possibly even more highly redundant than the Application tier server) for the Database. All, set right? This is the most common architecture in the enterprise today. It is expensive to implement, expensive to manage, and expensive to maintain, but it is the legacy that developers have given IT to support. 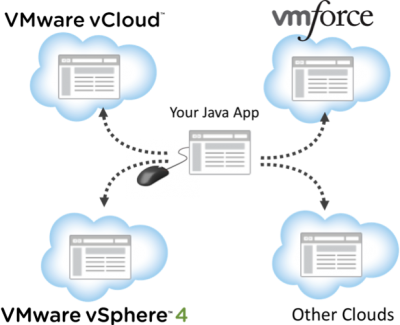 The benefit being that there is better scalability and flexibility with this model and with adding virtualization (which helps further the life of this architecture). 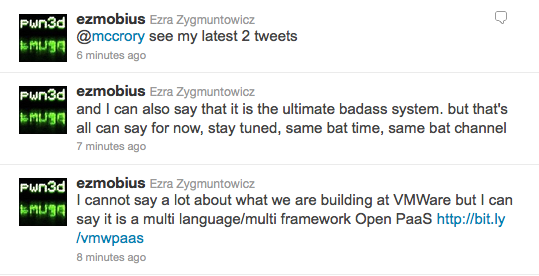 Where is Virtualization in all of this? 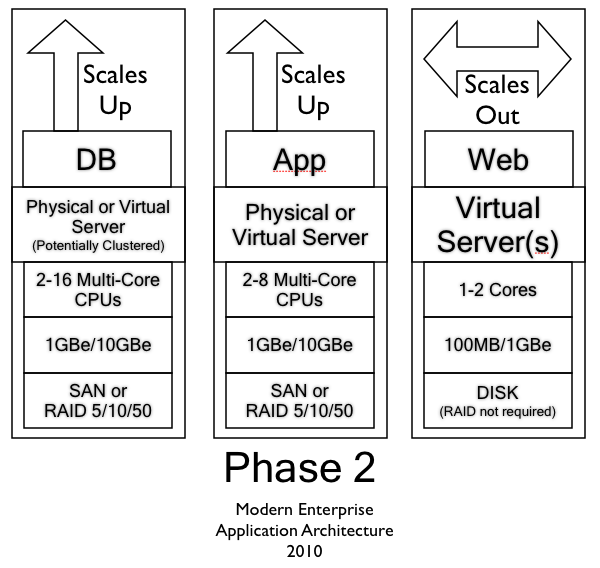 Virtualization is the closest Phase 2 could ever really get to the future (aka Phase 3, which is covered in my next post). Virtualization breaks the bond with the physical machines, but not the applications (and their architectures) that are running on top. This is why IT administrators have had such a need for capabilities in products like VMware ESX in conjunction with VMware vSphere like HA (High Availability), DRS (Distributed Resource Scheduling), and FT (Fault Tolerance). These things are required when you are attempting to keep a system up as close to 100% as possible. The trend toward Cloud architectures is forcing changes in development practices and coding/application design philosophies. Cloud architectures are also demanding changes in IT operations and the resulting business needs are creating pressures for capabilities that current/modern IT Architectures can’t provide. This leads us to what is coming…. CAP Theorem is firmly anchored in the SOA (Service Oriented Architecture) movement and is showing promise as a way of classifying different types of Cloud Solution Architectures. What follows is an explanation about CAP Theorem, how it works, and why it is so relevant to anyone looking at Clouds (Public, Private, Hybrid, or otherwise). CAP Theorem was first mentioned by Eric Brewer in 2000 (CTO of Inktomi at the time) and was proven 2 years later. 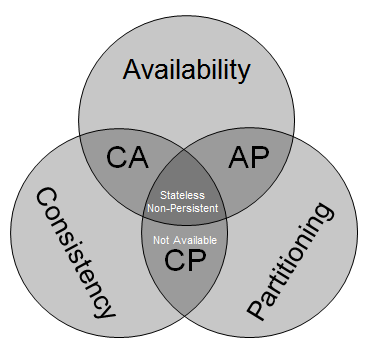 CAP stands for Consistency, Availability, and Partitioning tolerance. CAP Theory states that you can only have TWO of the three capabilities in a system. 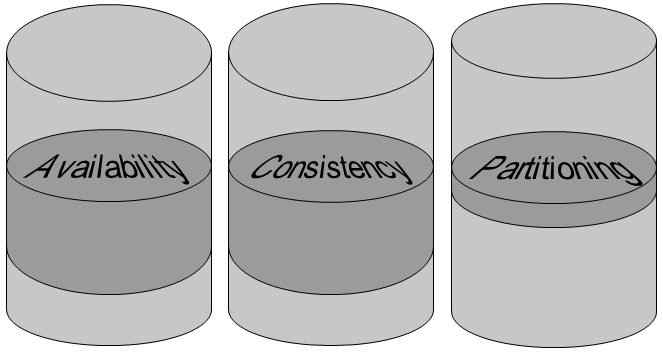 So you can have Consistency and Availability, but then you don’t have Partitioning tolerance. You could have Availability and Partitioning tolerance without rigid Consistency. Finally you could have Consistency and Partitioning tolerance without Availability. 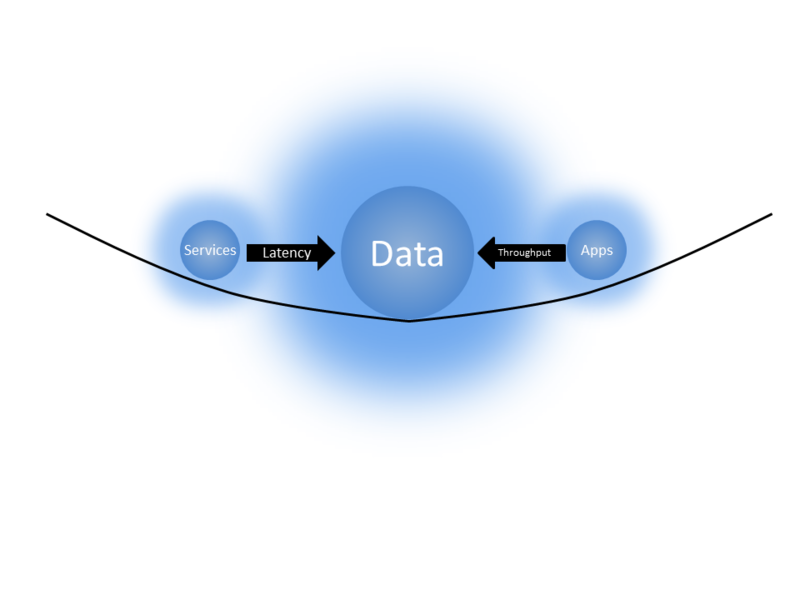 The KEY assumption is that the system needs to persist data and/or has state of some type, if you don’t need either Data persistence or State ANYWHERE, you can get very close to having Consistence, Availability, and Partitioning simultaneously. Consistency is a system’s ability to maintain ACID properties of transactions (a common characteristic of modern RDBMS). Another way to think about this is how strict or rigid the system is about maintaining the integrity of reads/writes and ensuring there are no conflicts. In an RDBMS this is done through some type of locking. Availability is system’s ability to sucessfully respond to ALL requests made. Think of data or state information split between two machines, a request is made and machine 1 has some of the data and machine 2 has the rest of the data, if either machine goes down not ALL requests can be fulfilled, because not all of the data or state information is available entirely on either machine. Partitioning is the ability of a system to gracefully handle Network Partitioning events. A Network Partitioning event occurs when a system is no longer accessible (Think of a network connection failing). A different way of considering Partitioning tolerance is to think of it as message passing. If an individual system can no longer send/receive messages to/from other systems, it has been effectively “partitioned” out of the network. A great deal of discussion has occurred over Partitioning and some have argued that it should be instead referred to as Latency. The idea being that if Latency is high enough, then even if an individual system is able to respond, the individual system will be treated by other systems as if it has been partitioned. cAP – A NOSQL Store (i.e. Cassandra, MongoDB, Voldemort), these systems are highly resilient to Network Partitioning (assuming that you have several servers supporting any of these systems) and they offer Availbility. This is achieved by giving up a certain amount of Consistency, these solutions follow an Eventual Consistency model. CaP – This isn’t an attractive option, as your system will not always be available and wouldn’t be incredibly useful in an Cloud environment at least. An example would be a system that if one of the nodes fails, other nodes can’t respond to requests. Think of a solution that has a head-end where if the head-end fails, it takes down all of the nodes with it. When CAP Theorem is put into practice, it is more of a balancing act where you will not truly leave out C,A, or P. It is a matter of which two of the three the system is closest to (as seen below). NOTE: Post to follow tying this more closely to the Cloud coming tomorrow. I’ve been spending a great deal of time as of late researching the background and roots of Cloud Computing in an effort to fully understand it. The goal behind this was to understand what Cloud computing is at all levels, and is quite a tall order. I think I have it figured out and am now looking for the community’s feedback to vet and fully mature my theory. First a brief review of CAP Theorem, which states that all implemented systems can only sucessfully focus on two of the three capabilities (Consistency, Availability, and Partitioning tolerance). If you aren’t familiar with CAP Theory, please check out yesterday’s post and the resources at the bottom of that page. First some background – Below are the two phases deployed today in >90% of Enterprises. See “Where most Enterprise IT Architectures are today” for in-depth discussion on Phase 1 and Phase 2. The modern web has taken hold and Hyperscale applications have pushed a change in Architecture away from the monolithic-esque 3-Tier that traditional Enterprises still employ to that of a loosely coupled Services Oriented queued/grid like asynchronous design. This change became possible because developers and architects decided that a Rigidly Consistent and Highly Available system wasn’t necessarily required to hold all data used by their applications. This was brought to the forefront by Amazon when it introduced its Dynamo paper in 2007 where Werner Vogels presented the fact that all of Amazon is not Rigidly Consistent but follows a mix of an Eventual Consistency model on some systems and a Rigidly Consistent model on others. Finally, the need for a system that operates at as close to 100% uptime and consistency, depending on a single system, was broken. Since then, we have found that all Hyperscale services follow this model: examples include Facebook, Twitter, Zynga, Amazon AWS, and Google. Why is Phase 3 so different than Phase 1 and 2? Phase 3 Architecture not only stays up when systems fail, it assumes that systems can and will fail! In Hyperscale Architectures, only specific cases require RDBMS with Rigid Consistency, the rest of the time an Eventually Consistent model is fine. This move away from requiring systems to be up 100% of the time and maintaining Rigid Consistency (ACID compliance for all you DBAs) lowers not only the complexity of the applications and their architectures, but the cost of the hardware they are being implemented on. Until around 7 years ago, CPUs were constantly increasing in clock speed to keep up with Moore’s Law. Chip makers changed their strategy to keep up with Moore’s Law by changing from an increase in clock speed to increasing the numbers of cores operating at the same clock speed. There are only two ways to take advantage of this increase in cores approach, the first is to use Virtualization to slice up CPU cores and allocate either a small number of cores or even partial cores to an application. The second is to write software that is able to asynchronously use and take advantage of all of the cores available. Currently most enterprise software (Phase 2) is not capable of leveraging CPU resources in the second way described, however many systems in Phase 3 can. How do IT processes fit into this? Why will Enterprises be compelled to move to Phase 3 (eventually)? The short answer is cost savings and operational efficiency, the longer answer is around the reduction in systems complexity. The more complex the hardware and software stack is (think of this as the number of moving parts) the higher the likelihood of a failure. Also, the more complicated the stack of hardware and software become, the more difficult it is to manage and maintain. This leads to lower efficiencies and higher costs, at the same time making the environment more brittle to changes (which is why we need ITILv3 in Enterprises today). To gain flexibility and elasticity you have to shed complex systems with hundreds of interdependencies and an operational assumption of all components being up as close to 100% as possible. Different systems have different requirements, most systems do not in fact need an ACID compliant consistency model (even thought today most have been developed around one. Some specific cases need ACID properties maintained and a level of 100% Consistency, but these are in the minority (whether in the Cloud or in the Enterprise). 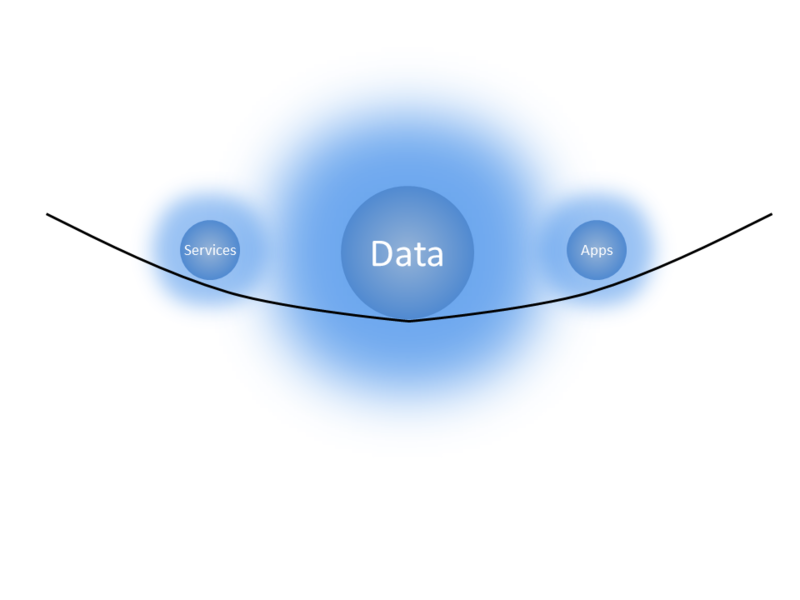 This is causing a split in data models between the current CA (Consistency and Availability – “Traditional Enterprise Applications) and AP (Availability and Partitioning tolerance – many Cloud Applications). A combination of these is the long term answer for the Enterprise and will be what IT must learn to support (both philosophically and operationally).